A slower swing speed can help improve accuracy. Swing speeds vary greatly among golfers, pros and amateurs alike. On the PGA Tour, history has shown pros can achieve success with a swing that is lightning fast or one that is leisurely. For amateurs, anxiety about playing the golf shot properly and trying to hit the ball farther often causes them to rush the swing or swing too hard, usually resulting in a less-than-satisfactory shot. In his book “My Golden Lessons,” golf legend Jack Nicklaus says that swinging too quickly is one of the major faults of amateur golfers--right from the start of the swing. He recommends that your shoulders, arms, hands and clubhead all move back in one piece for the first few feet of the swing. With his own swing, he even goes so far as creating a mental image of his hands and arms moving in slow motion in order to get his swing off to an unhurried start. Top golf instructor Butch Harmon, in the book “Breaking 100, 90, 80,” advises that most golfers will make better contact with the ball by making a controlled swing. You don’t need to swing fast. Making a full shoulder turn is the key to generating power to be released on the downswing. 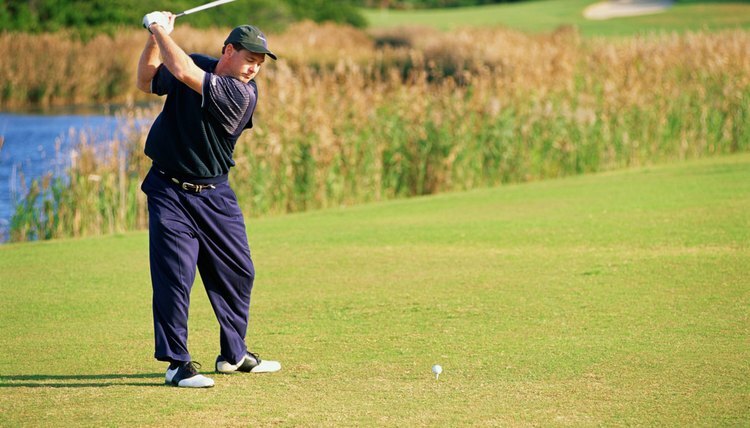 To maintain better rhythm, make a conscious effort to swing at 75 percent of your maximum speed. Nick Price, who has won two PGA Championships as well as the British Open, recommends in “Breaking 100, 90, 80” that golfers concentrate on making a fluid motion--and complete their backswing. They should avoid the tendency to quicken their swing with certain clubs, such as short irons. The goal is to make the same smooth swing with every club in the bag. LPGA Hall of Famer Judy Rankin says in “Breaking 100, 90, 80” that you should begin your swing with a smooth takeaway, and the key swing thought you have at the top of the swing is to transition to the downswing smoothly as well. After this smooth transition, your downswing acceleration can be aggressive--but remember to keep your balance. Fred Couples says in his book “Total Shotmaking” that good tempo is an important element of hitting solid long-iron shots. The great long-iron players he has observed start their backswing slowly and concentrate on a smooth tempo throughout the swing. You don’t need to swing more quickly to generate power--a mistake many amateurs make when trying for more distance with their long irons. You must take the time to coil the upper body on the backswing in order to build a powerful and accurate long-iron swing. Golf legend Arnold Palmer in his September 2009 “Golf Digest” article “Try My Timeless Tips” cautions against swinging too easy. He believes that golfers of all skill levels can learn to hit the ball squarely--and hard. You don’t want to lose your will to be aggressive with your golf swing, Palmer asserts, by practicing a swing that is too easy.